What it is: A waterproof eyebrow defining cream in a tube. What it is formulated to do: Fills, defines, and intensifies brows with natural-looking, stay-put color. What else you need to know: The result remains flawless throughout the day and holds up under all conditions (water, heat, etc). Use very sparingly. 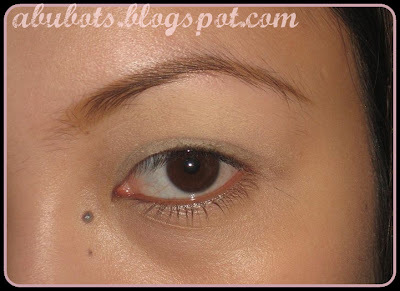 Apply then blend with slanted Eyebrow Brush to obtain a very natural line. For very precise corrections, use a very fine-tipped brush, such as Eyeliner Brush. Professional Tips: To change the color of your lashes, brush them with a mascara brush or lash comb soaked in Waterproof Eyebrow Corrector. It is also perfect for coloring graying sideburns and moustaches. I first heard about this corrector from Sophie and since then, i've wanted to get my hands on this product. Good thing Jamie offered to get this for me at a discounted price...woot! And eversince i started using this, there's no going back to my usual brow routine. a little goes a long way. All you need is a small amount (check Swatch 1 on my pics above) for one brow. This tube would last me months, even when used everyday! Reasonable priced. It sells for Php1100++ and though it's more expensive than my MAC brow set, i won't need to use any brow powder anymore. the price of the brow set plus my brow powder would cost me almost P2000. so this one is really cost-efficient! no allergies. i've used some brow mascaras before and it did give me some itching on my brows. gives me natural looking brows...hmm, at least close to my hair color. would u mind sharing what shade u are using on the pic? i think that's the shade i want..
oh wow! thanks for doing this review! been wanting to get my hands on one. i was worried it might cos 2k+. i'll definitely buy one once i get enough moolah. LOL. btw, how many shades are available? i've read good things about this! Could you comb this shade over black brows to lighten it a bit?